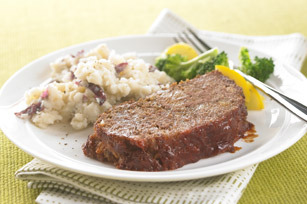 Mouth-watering and satisfying to the soul, meatloaf is the taste of home. 1. PREHEAT oven TO 375°F. In a small bowl, beat eggs lightly with a fork. This makes it easy to incorporate them into the meat mixture, so you won't have to overmix. 2. PLACE lean ground beef, stuffing mix, water, beaten eggs and 1/4 cup barbecue sauce in a large bowl. 3. MIX all ingredients with wooden spoon just until blended. 4. SHAPE meat mixture into an oval loaf in a 13x9-inch baking dish. Using a large baking dish makes it easier to pour out and discard excess fat. 5. TOP meatloaf with remaining 1/4 cup barbecue sauce. SUBSTITUTE: For a bolder taste, try Bull's Eye Barbeque Sauce. 6. BAKE 1 hour or until cooked through. No need to guess when the meatloaf is done cooking; just use a meat thermometer to check that the center has reached 160°F. Makes 8 servings.